Last week I quoted that great modern poet, Oprah Winfrey, cough cough, who described Queenstown and its surrounds as a place where ‘God was just showing off’. I endorsed that summary of this part of New Zealand, she was bang on the money. I am not sure if she made it to Fiordland or if she ever walked the Milford Track, something I have been waiting 40 years to do and have spent the better part of the past week doing. If she had, I suspect even she might have been rendered speechless. If the Big O made it that far she might agree with me when I suggest God may have been showing off in Queenstown but in Fiordland, God created a playground for giants in what is arguably the prettiest garden in the world. God, it seems, was also a bit of a dab hand at landscape gardening. How anyone can really begin to adequately describe a landscape of such epic scale and beauty as the Fiordland National Park is beyond me and exceeds my talents. This Park exists in an environment produced by geologic forces incomprehensible in their power, with glacial formed U-shaped valleys with near 1500 meter cliffs soaring almost vertically into the often brooding sky, of fiords 300m deep and forested valleys filled with hundreds of towering waterfalls, and as spring turns to summer, snow still sitting atop the highest peaks, I can imagine the Gods sitting around drinking a good local Pinot Noir and admiring their handiwork below. This is a place that almost defies description. I can’t do it justice. Photos can’t do it justice, you simply have to see it to believe it. I’d suggest leaving the camera at home, no photo I have seen that you might share with your friends and family will begin to recreate the sheer magnificence and immense scale of the place. Trust me - I just took over 2000….and not one did the place any justice at all. Milford Track is limited these days to 14,000 hikers annually and all must travel in the same direction over four days. What it meant was, you could walk for hours and see and hear no other humans (something I love). It was you, the sound of running water, the occasional avalanche (seriously but high in the mountains) and birdsong. You really get to enjoy a small part of the world as it has been for many thousands of years. We went with Ultimate Hikes who have a private concession in this UNESCO World Heritage Site, National Park that covers 8% of Te Wai Pounamu (South Island) and sits at its south western corner. On our first day as we crossed Lake Te Anau by boat to get to our starting off point we crossed the 45th parallel which meant that we were exactly half way between the equator and Antarctica (it felt I have to say more like Antarctica, it was a freezing day of only around 7 degrees). Day two up the Clinton Valley was simply breathtaking. The sun was more or less out, the temperature a very comfortable (for walking) 16-17 degrees. A relatively easy 17 km walk with light packs (we carried all our clothes, everything else was provided for us at the lodges) through thick rainforest, a big blue sky squeezed between the sheer cliffs and light fluffy clouds. Day three we trekked up and over the MacKinnon pass, greeted at the summit by a number of Kea (mountain parrots that have this insatiable curiosity - anything not tied down is chewed or stolen, I swear they have a form of OCD). The misty clouds danced and swirled and occasionally wrapped themselves around us offering only tantalizing, and at best, stolen glimpses of the forested valley a thousand meters below. We were at that stage far above the tree line and in fields of tussock grass. The walk down the other side as we left the tussock lands, saw the grasses replaced by the most beautiful of alpine flora - I had to keep telling myself this was a not a meticulously planned and planted garden, such was its perfection. The Mount Cook Lily (actually a buttercup) had just started flowering - its petals white as fresh snow contrasting with the greens, greys and browns around it. Those alpine plants gave way to forest once again and we were back in the company of giant trees, ferns and goodness only knows how many species of mosses. Late on day three we had the option of a side hike to the Sutherland Falls, New Zealand’s largest waterfall and the fifth highest in the world. Nothing prepared me for this. The Sutherland Falls lie in a deep valley, around 45 minutes’ walk (stagger by that stage) from Quinton Lodge. They lie off the main track and given it had been a pretty exhausting seven hour slog over a mountain pass I wasn’t going to go. My legs were more than weary, I was joint sore and feeling utterly spent physically but the promise of another walk among ancient towering beech trees, hundreds of years old and more crystal clear rivers with raging rapids perked me up and kept me going. These forests are my ‘happy place’. This is thick temperate rainforest. Ground ferns, beds of moss you can sink your arm into up to your elbow, liverworts, tree ferns and trees of every shade lined the track - everywhere life could be, it was. Plants filled every possible piece of the under-canopy and spilled over onto the track. This is a landscape dominated by rock, water and the colour green in every shade and hue. Even the mighty beech trees were covered in lime green mosses, many of these mosses dangling from the branches such is the moisture content of the air. As we approached the waterfall and perhaps 200m away from it, the roar grew louder, its spray being fired almost horizontally through the rainforest and with every step the wind generated by the force of the falling water increased in strength. The rain jacket was zipped up that little bit tighter in a reflex but largely futile attempt to keep the water out. Suddenly the trees parted and in front of us was a sight that took my breath away. Not just a waterfall, but a 580m high waterfall - only around three or four metres wide but containing millions of litres of the purest water cascading down over two terraces to where we stood. The noise was that of a jet engine. The wind battered us and I felt like we were standing in the teeth of a hurricane. This was the granddaddy of all waterfalls, tumbling from cliffs towering almost a thousand metres above us. Straight up. The old ‘Jurassic Park’ cliché springs to mind and the entire valley did look like it had been created by a movie maker and overlaid onto a blue screen and we were the tiny and insignificant actors. Had a Velociraptor poked its head out from behind a large, rotting log, I’d not have been surprised. This valley did not look of this world. We took the obligatory snaps more to remind ourselves of what we had seen, as you couldn’t begin to capture the entirety of those 580 meters, the majesty nor the magnificent fury of this tumbling, torrent of water. Then back to the lodge, day three under our belts and feeling very small in a very big and very challenging environment. I slept like the dead. Day three we woke to heavy rain. In this part of New Zealand we don’t measure rainfall in millimetres or even centimetres, but in meters. This corner of south western New Zealand lies in the region known as the ‘roaring forties’ which means it is windy and relatively warm and that means, wet. Moisture is driven up the western sides of high mountains by these westerlies, it condenses and it falls as rain. In fact it rains on 200 days a year. In sheets. Apparently we struck it pretty lucky as even on day three the rain had largely stopped a couple of hours into our trek. But those waterfalls had been refuelled. As we walked to the Sutherland Falls the night before the valley was filled with scores if not hundreds of waterfalls. Dwarfed by the Sutherland they were still impressive in themselves but by the next morning they were all in aquatic overdrive. It occurred to me that those early European explorers and surveyors who first came up these valleys were incredibly tough - no modern waterproof clothing and boots for them. Carried everything on their backs. They’d have been wet and cold for days. How they must have suffered when a trek that took us three days took them six weeks. The Maori who were the original builders of the trail many centuries before MacKinnon and Mitchell explored what became known as the Milford Track were also here in even less clothing and protection from the elements but such was their want and need for Pounamu (greenstone or jade), they too endured these tough elements. Archeologists have found human bones in some of the caves here suggesting some paid a heavy price for this most prized of rocks. It is equally clear the Europeans who surveyed these parts in the 19th century had not a poetic bone in their bodies. As a result we walked downArthur Valley, sat by Lake Ada, traversed the Clinton Valley and stood beneath the Sutherland Falls - if I were naming this place it would have to be ‘Valley of a thousand waterfalls’ and it is no numerical exaggeration. This place is sculptured by water. Originally by frozen rivers of ice and now by the liquid form. Not only does it tumble out of the sky or travel down waterfalls to the rivers below in thousands of streams, the water here is surely among the most pure in the world. We carried water bottles and drank our fill from water that, despite, or perhaps because of, being filtered through layers of moss had not the slightest taste of vegetation or dirt and was crystal clear - it was the sweetest water I have ever drunk. The water running through the streams and rivers was in fact so clear, we spotted fat trout, hanging in the currents from 100m away. You could count every pebble lining the river beds, often several meters deep, if you were so inclined. A final thought if this has in any way inspired you to follow in our footsteps. You need to be moderately fit to do the Milford Track and it is not for sissies but anyone that gets into reasonable shape can, through Ultimate Hikes, enjoy what is truly an amazing slice of God’s Own country as we like to call New Zealand. A place where (a) God may well have been showing off but man, got it so right. This is such a dream. I would add it to my bucket list but the bucket is too frail. However I make a wish my son living in Rangiora will someday be able to make the excursion. How much more difficult a trek was it than Tongariro? We did that in 6 hours straight with only a few 5 minute breaks and a bit longer lunch break at the far hut and my leg with an issue only had problems the last 3 km downhill. And hownwere the sand flies and mosquitoes there? As bad as they predicted? I haven't been across the Tongariro - I hear these days there's fewer people sitting in peak hour traffic on Auckland's freeways. If I did this walk again, understanding now the state of the tracks, the degree of difficulty of each day. I'd probably stop for about 15 minutes every 90 and that would add another hour or so to the walking day which would work just fine. The sandflies were pretty much everywhere in the valleys and found us every time we stopped. They were absent when we were on the move. We had repellant on most of the time but on more than one occasion I was thinking about wishing I had that shotgun I spoke of last weekend. I'm now Chief Co-Ordinator on organising the three day, two night Routeburn next year. Half of my staff both sides of the Tasman has said they want to come. Oprah had it spot on! 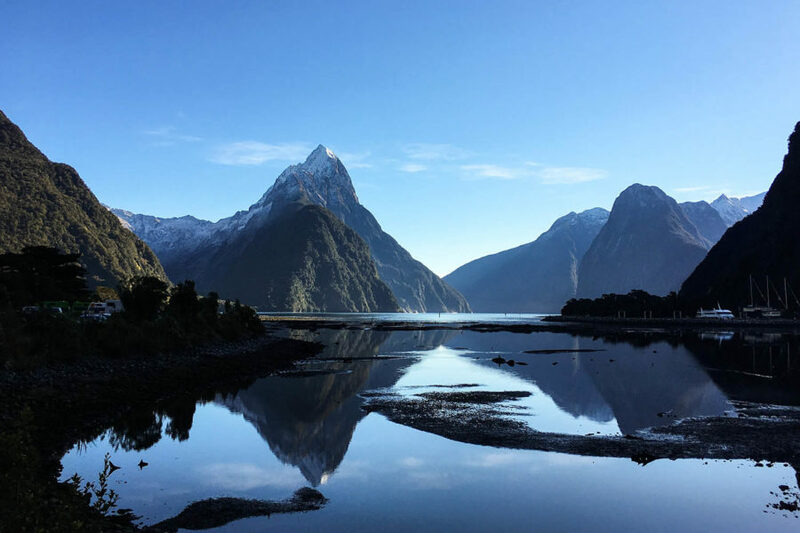 We are truly lucky to live in this part of the world, our tours feature heavily in the Fiordland and Queenstown regions for this very reason - it's just spectacular!